Anyone who experiences health concerns where anxiety is part of the puzzle can benefit from NeurOptimal®. Anxiety means that the central nervous system is working overtime which often leads to people experiencing exaggerated worry, expecting the worst, irritation or nervous energy, fatigue and sleep and/or concentration issues. Many people today have a central nervous system (CNS) that is in the “fight, flight or freeze” response setting – even when there may be nothing specific going externally to cause this. Through NeurOptimal® training, the brain learns each time the CNS is in this state and the CNS then calms or resets because during the session there isn’t anything happening to cause that state. Over time, the overall level of alertness in the CNS decreases. 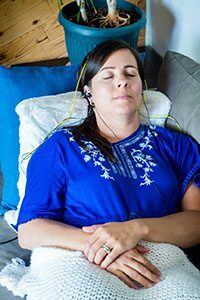 Jay found that, after a series of sessions, she was able to respond to everyday ups and downs with more ease and clarity and she was able to use tools like breathing, meditation and yoga on a much more regular basis. Situations that used to bother her or put her off balance either no longer did so or the sense of upset lasted for much shorter periods of time. Kevin’s parents observed that he didn’t get as upset and angry as often and he was able to calm down more quickly. They are now able to play board games and do more things together as a family because of fewer meltdowns. Teachers found that he was calmer in class, more open to learning new things and getting more work done. One teacher said he “seems happy now”.